According to Green Left Weekly, February 8th, 2006, Venezuelan President Hugo Chavez, in a series of fiery speeches on the closing day of the World Social Forum in Caracas, warned the US government that a US attack on Iran would be “10 times worse than Iraq”. While I am certainly no advocate of an attack on Iran, it is interesting to note Chavez's increasing support for Iran and its new President, Mahmoud Ahmadinejad. 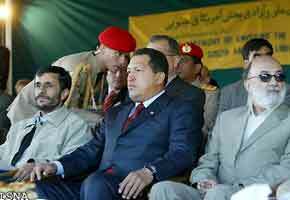 In 2004, while still mayor of Tehran, Ahmadinejad welcomed to Venezuelan President Chávez on his visit to that city. Chávez was welcomed with a new statue of Simon Bolivar, Venezuela's national hero, in the Goft-o-gou park in Tehran. In September 2005, new Iranian President, Ahmadinejad hailed Venezuela's "brave and judicious" vote against the EU-proposed resolution passed by the International Atomic Energy Agency's Board of Governors. Talking to Hugo Chavez on the phone, President Ahmadinejad thanked Venezuala for its support for Iran's right to gain access to nuclear technology for "peaceful" purposes. President Ahmadinejad said that the vote, showed the depth of the two country's "brotherly and friendly ties". Hugo Chavez has made four visits to Iran in his six years as president and the two countries have signed nearly 50 documents for co-operation since 2004. During their third Joint Economic Commission session, Caracas and Tehran signed 21 documents for co-operation in various fields, including gas and petrochemicals. President Chavez has stated that when it came to sharing technology Iran is his most important partner. On February 12th, 2006 President Ahmadjinead welcomed Chavez's proposal for energy cooperation with Venezuela and the new socialist government in Bolivia, headed by Chavez's friend, Evo Morales. President Ahmadinejad. also welcomed a proposal from President Chavez to develop tripartite cooperation between Tehran, Caracas and La Paz on energy. Ahmadinejad also hoped that the upcoming visit to Caracas of Iranian ministers would prepare the ground for enhancing the level of economic cooperation. President Chavez called for cooperation in the field of oil and gas and said that Iran is expected to supply Bolivia with technical assistance to help the Bolivian government nationalize its oil and gas industry. President Chavez also renewed his invitation to President Ahmadinejad to visit Caracas and hoped that he would visit Tehran in the first half of 2006. Well I think it's crazy Chavez and Castro hugging up to Iran's nutty president but I suppose you could say both leftist and rightist regimes have sucked up to Muslim fundies when it suits their strategic needs. For example the US supported Osama and co in Afghanistan in the 1980's. These groups went on to become the Mudjahadeen, the Teleban and Al Qaeda. You're quite right Cameron. The US has been author of much of its own misfortune by poking its nose all over the planet. However my point is that revolutionary socialism, will use Islam (as well as "progressive" Christianity") to further its ends. Its the old front group strategy. The socialists stirring up trouble and letting the Muslims take the bullets. Good to see you admit that, Trevor. Many right-wingers are of the "the USA can do not wrong" mold. As regard to Iran and Venezuela, it is probably a case of the-enemy-of-my-enemy-is-my-friend. I think anon has just hit the nail on the head. I agree with him or her. Yeah Trev I am pretty pleasantly suprised about you not being of the "US does no wrong mould". Chavez was also friendly with Saddam.